I try to build with sustainable woods. I often build with locally grown wood. That said, my favorite fingerboard wood is Macassar Ebony. It is more stable under weather changes than any of the other common fingerboard woods and it looks good. Supplies of Maccassar Ebony are declining world wide. I have tried Persimmon and Osage Orange. 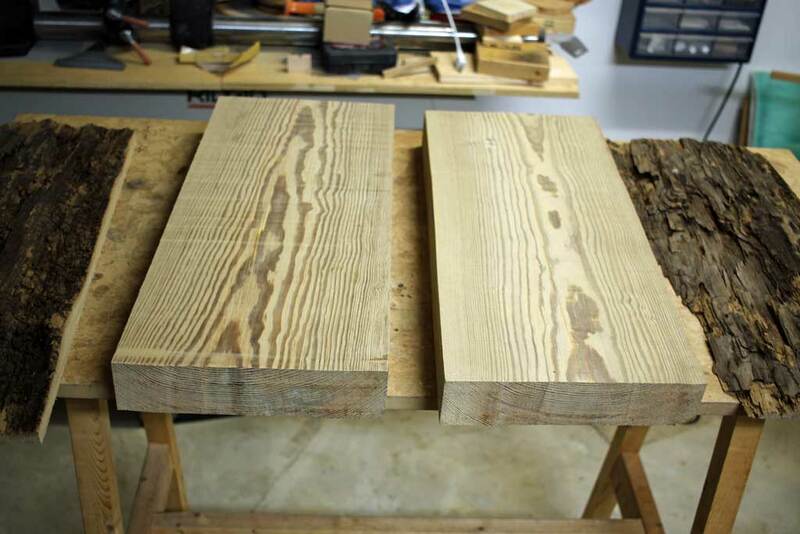 When I can no longer get Macassar Ebony, I will probably make my fingerboards of Osage Orange. While the woods used in a guitar may lend a distinctive color to the sound, it is the builder and the builder's practices that define the sound for an instrument. Three different builders can build three identical guitars from the same plans with wood from the same trees and those guitars will not sound alike. If you try out guitars blindfolded and have a friend hand them to you unidentified, you may be amazed at what you hear. Don't let your prejudices about wood get in the way of selecting the sound you want. Engelmann Spruce Engelmann Spruce is my preferred top wood. It is a bit softer and lighter than typical Sitka Spruce. The top is a bit more compliant than Sitka. In other words, you can play with a softer touch. I think the resulting tone is a bit warmer. For me, it's particularly nice for fingerstyle playing. Sitka Spruce Sitka Spruce is typically a bit stiffer than Engelmannn. It is the go to wood for most guitar manufacturers because it is easily available and its characteristics are well known. I use it for larger instruments, for most of my dreadnaughts (the Dreaded Maury model), and when the stiffness is useful in an instrument for structure or for tone. I have built a guitar with Torrified Sitka Spruce (that means it was baked in the absence of oxygen to prematurely age it). It sounded like another I had built that had been played for ten years. The torrified spruce was lighter and a bit more brittle than unbaked spruce. I will build with it again on request. Adirondack There is no old growth Adirondack Spruce available. What we can get is from smaller trees, some only 70 years old. The grain is often wide with a lot of variation. 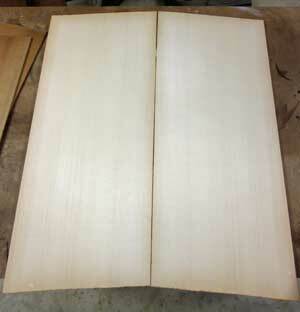 But, it is still Adirondack Spruce--it's strong and light and makes a guitar with a lot of punch. Other top woods I have built with Western Red Cedar and with Redwood. They are not my preferred woods because both require special handling during the building process (they are prone to splitting). I have on hand some Port Orford Cedar. Eventually, I will top an instrument with it.. The usual I build with East Indian Rosewood, Mahogany, Sapele, Black Walnut, Black Locust, or any of the other commonly available back and side woods. I don't build with any woods that are likely to come under suspicion under CITES or Lacey Act restrictions. Given the small number of guitars that I build each year, I have no need to use these woods. Osage Orange This is my favorite back and side wood. 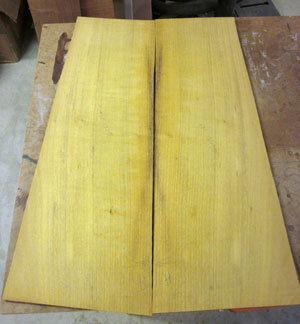 The rumor in the luthier community was that Osage Orange is the sonic equivalent of Brazilian Rosewood. I have compare one of my Osage guitars to a well-built Brazilian Rosewood guitar and I think the Osage sounds better. The notes are rich and full, but there is more separation between them than with a typical rosewood guitar. You can strum a chord, let it hang, and still pick out the individual notes in the chord as it sounds. This wood is seldom commercially available. I got mine from a man I met at a party in King George County, Virginia. He has been very generous. I am very happy to know him. Persimmon Persimmon (Diospyros virginiana) is American Ebony although, as you see, it is a light-colored wood. Like Ebony, it is very hard and has small pores. Like ebony, it makes a guitar with a rich tone and long sustain. 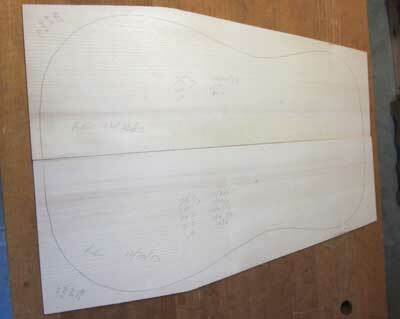 It is very hard to obtain pieces large enough to make guitars. A few years ago, one of my suppliers bought a felled Persimmon tree, called me, and sold it to me. I have a good supply of this wood. Sycamore Sycamore is very close to mahogany in density and hardness. 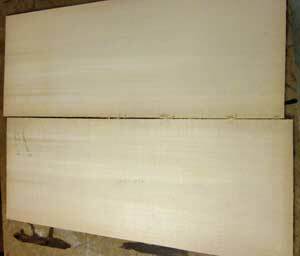 It has a beautiful grain pattern when quartersawn. These guitars have a tone which is true to the fundamental, a bit more sustain than mahogany, and a good punch. Dam Wood Pine This pine was cut sometime in the 1840's to be part of the crib dam in the Rappahannock near Fredericksburg. The dam was part of the canal navigation project completed in 1849. The wood was submerged from1849 until 2004 when the US Army Corps of Engineers blew up the concrete power generation dam just downstream. Some of my friends and I retrieved this piece of wood from the river. I made an acoustic guitar from Oak and Pine that were part of the crib dam. That guitar was auctioned to benefit the Friends of the Rappahannock in 2006. This wood would make an excellent electric guitar body. I have enough to make one. It could be yours.